Writers are “special” people. But don’t worry, it is not always contagious. This guide will help you self-screen for this condition before it becomes terminal. I’ve done this a couple times before, parody Jeff Foxworthy’s “You might be a redneck” routine, and I’ve even done it with “You might be a writer” before. But this is a bigger, more complete collection, which I hope you enjoy. If you are unfamiliar with Jeff Foxworthy, here is a short video to get you in a humorous mood. Plus, it somehow seems more authentic to read these with Jeff Foxworthy’s accent. Try it, just for fun. And let me know which sign(s) that you might be a writer applies most to you. If you sometimes lie awake at night wondering whether there is a connection between burning books and Hell being full of fire, you might be a writer. If you get giddy over closed caption TV because they broadcast the screenplay, you might be a writer. If even small things require writing an entire blog post, like this one, you might be a writer. If you think the opposite of wrong is “write”, you might be a writer. If your favorite Bible character is Daniel, not because he survived the night in a lion’s den but because he could read the writing on the wall, you might be a writer. If people cringe at your thank-you notes because they run on for 17 pages, you might be a writer. If a whole shelf on your bookcase is dedicated to books with your name on them, you might be a writer. 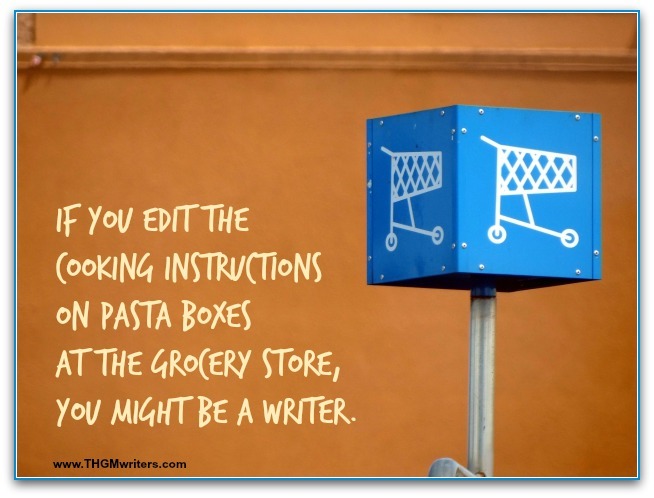 If you edit the cooking instructions on pasta boxes at the grocery store, you might be a writer. If you don’t mind singing off key, as long as you get the words right, you might be a writer. If you fight insomnia by counting typos, you might be a writer. If you tell your daughter that her math homework is not compelling enough to the audience, you might be a writer. If you won’t drink Starbucks coffee because they removed the words from their logo, you might be a writer. If you always do things by the book, you might be a writer. If you’ve ever risen in church to correct the preacher’s grammar, you might be a writer. If you can’t wait for the “Internet of things” so you can finally get a spell checker for the items in your fridge, you might be a writer. If your Roman holiday itinerary is based on Angels and Demons, you might be a writer. If you hold back crucial scheduling details from your family to keep them in suspense, you might be a writer. If you measure time in “pages written”, you might be a writer. If you’ve ever written to the International Olympic Committee demanding that they include Spelling Bee as an Olympic sport, you might be a writer. 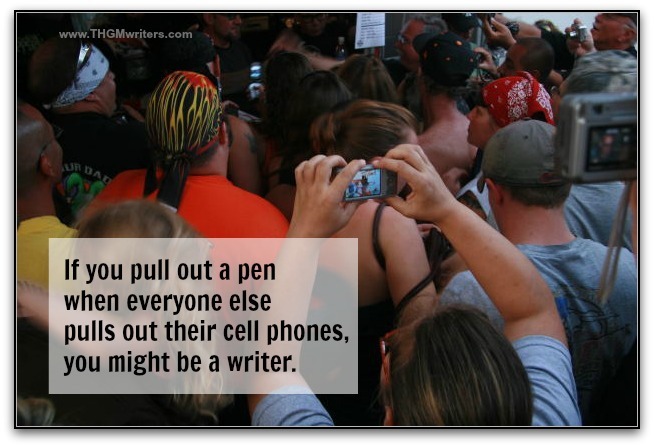 If you pull out a pen when everyone else pulls out their cell phones, you might be a writer. If you’ve ever called out the President of Honda for misspelling “Infiniti”, you might be a writer. If you can’t wait for them to make a movie out of Roget’s Thesaurus, you might be a writer. If you try to organize your cutlery alphabetically, you might be a writer. If you avoid drinking milk because yogurt has more culture, you might be a writer. If you start pulling the dust jackets off all your books when somebody shouts “Run for cover!”, you might be a writer. If you look for a “blurb” on the back of a jacket when shopping for clothing, you might be a writer. If you can’t understand why pill container labels have such tiny letters, you might be a writer. Or you could be just about anybody, for that matter. If you’ve never been at a loss for words, you might be a writer. If you’ve ever been suddenly awakened by an electric shock in the face, because your drool flooded your keyboard in the wee hours of the morning, you might be a writer. If you go to the library to get close to God, you might be a writer. 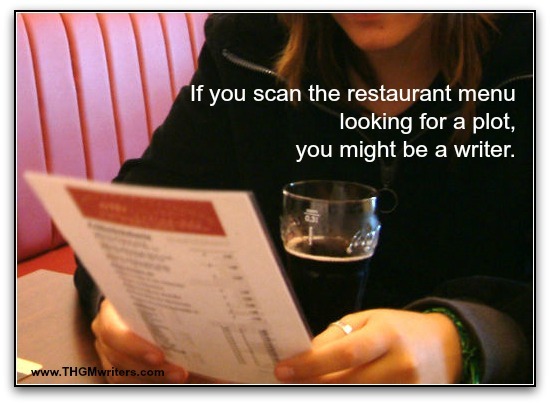 If you scan the restaurant menu looking for a plot, you might be a writer. If you feel that your life is incomplete without chapter titles and flashbacks, you might be a writer. If you think social bookmarking is a game you play at the library, you might be a writer. If your hate-list includes Wordless Wednesday blogs and music CDs with no lyrics, you might be a writer. If you ask your son whether the new kid in school is the protagonist or the antagonist, you might be a writer. If your reaction to designer clothes at the mall is “Who wrote that?”, you might be a writer. If you fantasize about typewriters, you might be a writer. If you ever dreamed you were a typewriter, you might be a writer. If you even know what a typewriter is, you might be a writer. If you are excited that so many people are into a face book, you might be a writer. If your favorite art form is the font, you might be a writer. If there is never enough space to type in your “favorite book”, you might be a writer. If your Youtube song search usually includes the word “lyrics”, you might be a writer. If you prepare an outline before telling your spouse about your day, you might be a writer. 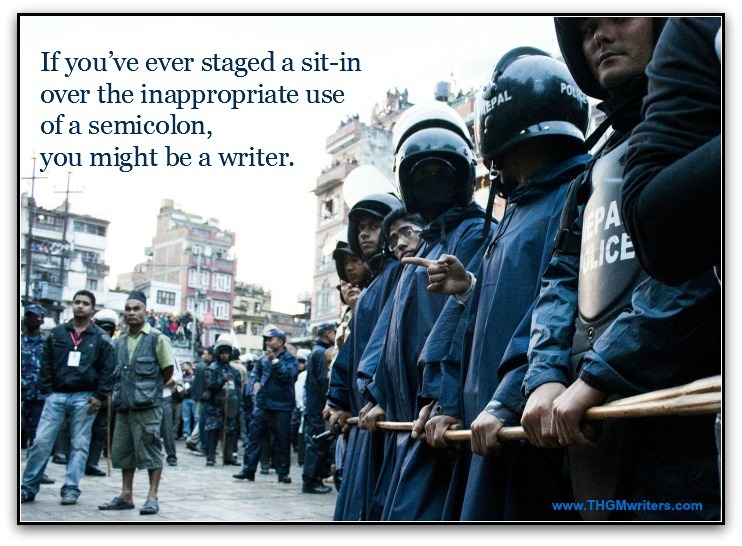 If you’ve ever staged a hunger strike over the inappropriate use of a semicolon, you might be a writer. If your favorite part of vacation is “booking” the flight, you might be a writer. If you’ve ever tried to organize a book club among fellow passengers on a plane or bus, you might be a writer. If you autograph the magazines displayed at the checkout counter, you might be a writer. If “Paperback Writer” is your favorite song of all time, you might be a writer. If you are still trying to teach your pet to spell his name, you might be a writer. If the worst nightmare you’ve ever had was running from an avalanche of crumpled paper rolling down the side of a mountain, you might be a writer. If you use a pen name when registering to vote, you might be a writer. And if you are still reading this long-winded post that I’ve written, you are obviously a writer (and you’ll really enjoy my thank-you notes!). Bloggers and writers! Feel free to use the images in this post on your website. They were made lovingly with you in mind, from a fellow writer. A brilliant encapsulation of the tell tale signs! There is one more which I am guilty of: when you go off on a rant at an ATM machine because chequing is spelled checking, then you might be a Canadian writer! This is really an amazing post! I really enjoyed reading it! Hey I am here via your latest post on this line. These Ifs are really interesting! but at the same time serious one too! I could relate to some of it! Thanks Dave for sharing this hilarious but at the same time a serious and thought provoking one! What a joy to read. I am still smiling. The pains we have to go to ensure a semicolon is used correctly. I have not had dreams of paper avalanches but swimming in reams of A4 paper (my favorite – starting with a blank piece of paper, the potential excites me). I still look at typewriters thinking they were the days and thanks for giving my small finger muscles from having to work that A key.